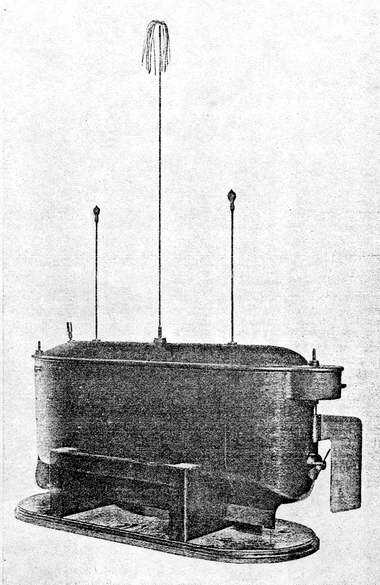 Teleoperated boat of N. Tesla – FOP Shvachko V. V.
In 1898 Nikola Tesla publicly demonstrated a radio-controlled (teleoperated) boat, similar to a modern Remotely Operated Vehicle (ROV). Based on his patents U.S. Patent 613,809 2, U.S. Patent 723,188 2 and U.S. Patent 725,605 2 for “teleautomation”, Tesla hoped to develop the wireless torpedo into a weapon system for the US Navy. 1. History of robots. – Mode of access: http://en.wikipedia.org/wiki/History_of_robots. 2. File:Tesla boat1.jpg. – Mode of access: http://en.wikipedia.org/wiki/File:Tesla_boat1.jpg. 3. Patent US613809 – TESLA – Google Patents. – Mode of access: http://www.google.com/patents?vid=613809. 4. Patent US723188 – NIKOLA TESLA – Google Patents. – Mode of access: http://www.google.com/patents?vid=723188. 5. Patent US725605 – NIKOLA TESLA – Google Patents. – Mode of access: http://www.google.com/patents?vid=725605. 6. PBS // Tesla – Master of Lightning // Remote Control. – Mode of access: http://www.pbs.org/tesla/ins/lab_remotec.html. 7. Nikola Tesla. – Mode of access: http://en.wikipedia.org/wiki/Nikola_Tesla. 8. Нікола Тесла. – Mode of access: http://uk.wikipedia.org/wiki/%D0%9D%D1%96%D0%BA%D0%BE%D0%BB%D0%B0_%D0%A2%D0%B5%D1%81%D0%BB%D0%B0. 9. Тесла, Никола. – Mode of access: http://ru.wikipedia.org/wiki/%D0%A2%D0%B5%D1%81%D0%BB%D0%B0,_%D0%9D%D0%B8%D0%BA%D0%BE%D0%BB%D0%B0. 1 This image (or other media file) is in the public domain because its copyright has expired. 2 All patents available through Google Patents come from the United States Patent and Trademark Office (USPTO). Patents issued in the United States are public domain documents, and images of the entire database of U.S. patents are readily available online via the USPTO website.